By Baxter, Woodhouse & Taylor Ltd. Size 1 (but appears to be quite large!). 1956 dated. One piece 'WINDAK' suit in heavy blue cotton. Zipped from the groin to the neck with a press stud fastened storm flap. Integral hood with drawstring closure. Flapped pockets on either side of the waist and flapped patch pockets just above the knees, the latter with eyelet 'drain holes'. Full cotton lining with integral braces/suspenders to help aleviate the weight of the suit. Integral wiring loom between the lining and outer cloth. 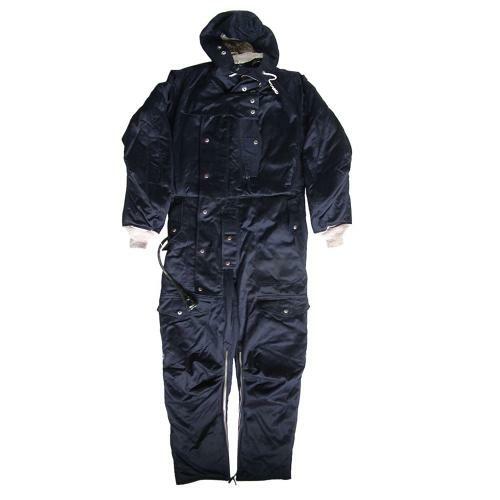 This serves to heat the suit and provide a current to connectors at the wrists and ankles where electrically heated gloves and bootees were attached. Knitted collar and wristlets. Excellent, probably unused condition. The suit is clean and undamaged and has working original 'Lightning' zips. Minor verdigris on some metal parts and age related wear on the rubber washers of the heated glove/ankle connectors. Retains the umbilical cord and large rubber covered 2-pin plug. With manufacturer's labels, one with Admiralty anchor stamp. These would appear to have been issued to the Royal Navy and Fleet Air Arm but precise use in unclear. The suits bear strong resemblances to both the WW2 yellow 'Taylorsuit' produced by the same company and the 'Beadon' flying suit (collar/cuffs). A superb rare suit and an excellent display piece. Stock code S22307.